St. Bridget, a legendary Irish saint, created a sensation by turning her bathwater into beer. What better way to celebrate her worthy miracle than with our zymurgistic tribute to her feat, St. Bridget's Porter. St. Bridget's is a smooth, elegant, and chocolaty brown porter. Brimming with coffee and chocolate characteristics from dark barley malts, St. Bridget's is carefully hopped to provide the perfect complement to its malty robustness. The beer pours a clear dark brown with deep ruby hues. Held up to a light you can just barely see through it. It also produced fairly rich tan head. What a wonderful nose; sweet roasted malts with notes of chocolate and coffee. I can’t wait to dive into this one. Oh my, that is better then a lot of stouts that I’ve had. You start off those sweet roasted malts then in mid sip you start to pick up the more robust roasted flavors of the malt. By the time you get to the swallow you start to pick up a coffee flavor and a little malt bitterness. The back end of the swallow has some hop and malt bitterness. The finish of this beer has an almost espresso coffee taste to it. There are also some chocolate notes in the finish of this beer. The final aftertaste and mouthfeel is of a rich roasted malt coating all over your tongue and mouth. This is one impressive porter. There is always a fine line on how stout a porter can be before it is considered a “Strout Porter” or otherwise just known as a “Stout”. One man’s porter is another man’s stout. This is probably the most I would want in a porter before I would consider it a stout. The beer is now at 60 degrees and it’s smoother than ever. I thought the espresso taste at the end would kill this for me but even that bitterness mellowed as it warmed. 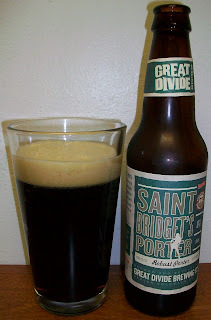 All and all this is a very good porter; a solid B for St. Bridget’s Porter.